With Monster Hunter 3 Ultimate, Capcom’s â€œlove it or hate itâ€ Monster Hunter series makes its third Western console debut on Nintendo’s Wii U. If this is your first foray into the series, here is a bit of background on the world of Monster Hunter, outside of Japan. The original Monster Hunter was released on the PS2 outside of Japan to lukewarm critical reception and little notoriety. 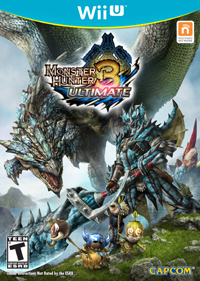 The series, however, managed to amass a large cult following in the US and Europe with the Monster Hunter Freedom series on the PSP platform, and 2010 saw the release of Monster Hunter Tri on the original Wii. While boasting a good amount of new features and content, the biggest draw of Tri is still that it’s the second console release of the series to make it outside of Japan, and Monster Hunter fans everywhere anticipated playing the game on an actual TV with an actual controller. Though it was possible to play Tri with a Wiimote and Nunchuck, or the existing Classic Controller, Capcom capitalized on this by offering a special edition of the game with Nintendo’s official â€œPro Controller,â€ which was definitely the best way to go for hunting monsters in Tri. Though little has changed mechanically from the series’ PS2 conception, the Wii release saw a much warmer response from critics, only further solidifying fans’ longtime belief that the prior games were simply being reviewed by the wrong people. Monster Hunter, again, if you aren’t familiar with the series, takes place within a highly stylized conceptual world and follows a simple rinse, wash, repeat premise as far as gameplay is concerned. In some unidentified mystery world, a pseudo prehistoric race of humans find themselves at never ending odds with a plethora of monstrous creatures. The humans build pseudo prehistoric villages, craft pseudo prehistoric weaponry and armor for protection (though some of it appears more modern in style), hunt and gather amidst various pseudo prehistoric landscapes, and depict their races’ trials, tribulations, and glories in a pseudo prehistoric cave painting style of illustration. Basically, for lack of a more defined way of summing it up, your character is a caveman or cavewoman, in some kind of alternative â€œBCâ€ time period where hunting equates to not only worth, but survival, and instead of slinging rocks at a T-Rex in hopes the beast will give up its pursuit to eat you and your village, you bring the fight to it. This is generally accomplished with giant swords, lances, bows, crossbows, and a bevy of other, again, pseudo primitive arsenal items. Oh, and instead of a T-Rex, it’s a giant, flame spewing dragon. This very specific concept has been extremely well realized through all the existing editions of the Monster Hunter series, and MH3U is definitely no exception in these regards. The animations are fluid and dramatic, the monsters menacing and frightful, and pretty much all aspects of the game, no matter how trivial, are generously sprinkled with the game’s unique and quirky aesthetic. 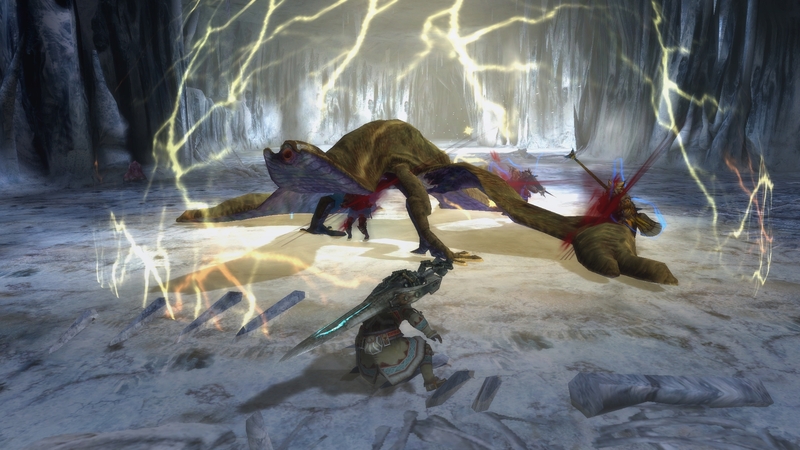 As a series, there is nothing quite like the experience Monster Hunter can offer you. Your hunting exploits begin with a series of rudimentary tasks that help you come to terms with the various things that make the game work the way it does, and acclimate you to the game’s purposefully unorthodox controls and mechanics. If you’re a seasoned monster hunter, you’ll likely breeze through these. You’ll be doing most of you monster hunting via quests that are available at a guild counter, which will see you visit a certain location and either slay or capture a certain monster or monsters, or gather a certain number of items available in said location. As you progress, you’ll be visiting a blacksmith NPC who can create new equipment from the items and monster parts you’ve collected on your hunts, which ultimately boils down to the real meat and potatoes of the game. The catalog of weapons and armor is vast, all of which will potentially provide you with statistical boosts along with whatever defense value each offers. 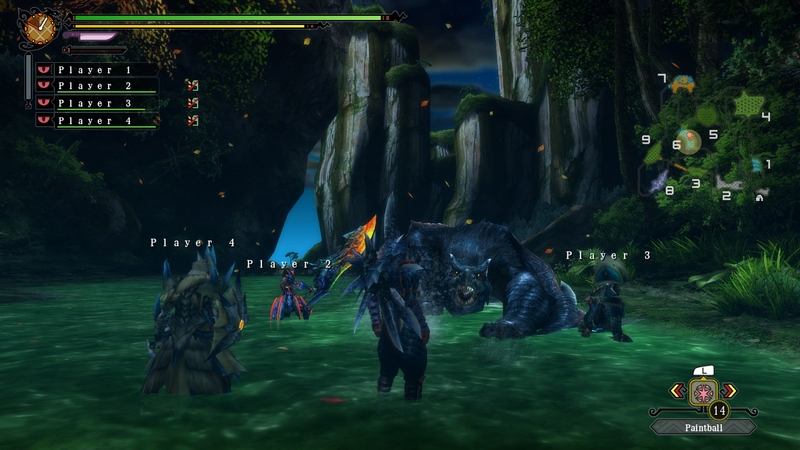 Since the Monster Hunter series has never incorporated a traditional â€œlevel upâ€ system like many of the games it could be compared to, collecting parts and building or upgrading better and better armor and weapons is essential when attempting the game’s more challenging hunting scenarios. Like any of the other games in the series, there is little exposition and character development, though reading the conversations from the numerous NPC’s can occasionally provide a good chuckle. Monster Hunter is, as its name pulls no punches in suggesting, about hunting monsters. As big and as many as possible, and again, with that in consideration, MH3U provides the goods in spades. But what if you’re already a seasoned Monster Hunter? Well, in those regards, MH3U might not be as exciting as you’d hope, but you’ll still have a great experience none the less. A large amount of MH3U is a considerably remixed, mechanically tweaked, high definition version of 2010’s Monster Hunter Tri on Nintendo’s Wii console. The single player village is identical, save for a few added touches, and leading up to the big showdown with Tri‘s flagship monster menace â€œLagacruisâ€, will equate to a similar retread of the content from the aforementioned game. In the mix though, especially after the halfway mark in offline mode, you’ll see plenty of quests involving monsters that players outside of Japan never got to hunt (albeit in English), which, in turn, incorporates a large addition to the already extensive catalog of armor and weapons one can make. I personally found MH3U a bit too similar when I first started it, having put a considerable amount of time into most of the stateside releases in the series. However, after working with it for close to one hundred hours now, I have no reservations in realizing that it is definitely the most comprehensive and content thick Monster Hunter edition to date. Calling MH3U a â€œMonster Hunter Greatest Hits Collectionâ€ wouldn’t be a long shot, and as a long time fan of the series myself, I can certainly say that this one has just about everything. MH3U is also highly accessible via a number of peripheral options on the Wii U console. The original Pro Controller that was released with Tri is one hundred percent compatible with the game, and works without a hitch. You can also use the new Wii U Pro Controller as well. The Wii tablet can be used as your main controller, though given the usually meticulous nature of controlling your character in the game, using it might prove troublesome. If this is your first trip into the world of Monster Hunter, you might be able to get accustomed to the tablet exclusively, but previous players are definitely going to want to invest in an alternative controller. Whether you use it as your main interface or as a companion to an alternative, the tablet screen can be customized with a number of various options to suit your needs in the game. Various panels representing actions or information in the game can be laid out on the touch screen that can function as your item bag, status, and even allow instant access to combining items on the fly. You can even assign the traditional mini map exclusively to the touch screen and make even more room for the gigantic monsters to get in your face. The Wii U controller has definitely been utilized well for MH3U, and is sure to offer at least a few helpful tools you’ll wish you had in any of the previous games. A staple for the Monster Hunter series collectively has always been its online multiplayer component. As one of the first and few titles to make use of the PS2 Network adapter, Monster Hunter has never existed without the ability to tag team giant things with your friends or like-minded strangers. The quests and challenges differ greatly from those available in the single player, and are usually more demanding with their goals, and feature tougher monsters much earlier in the ranks. The monsters collectively are beefed up in both their HP and damage output in online quests as well, but overcoming such challenges will obviously see you walk away with greater rewards. The Online functionality of MH3U has been elegantly streamlined in comparison to the client on Tri. The Wii U controller serves as a clear and totally functional microphone on its on, and is a huge upgrade when compared to the fickle Wii-Speak peripheral players struggled through using with Tri. Finding friends is quick and easy, and the already booming online community for the game is plenty accessible for new players or experienced players. 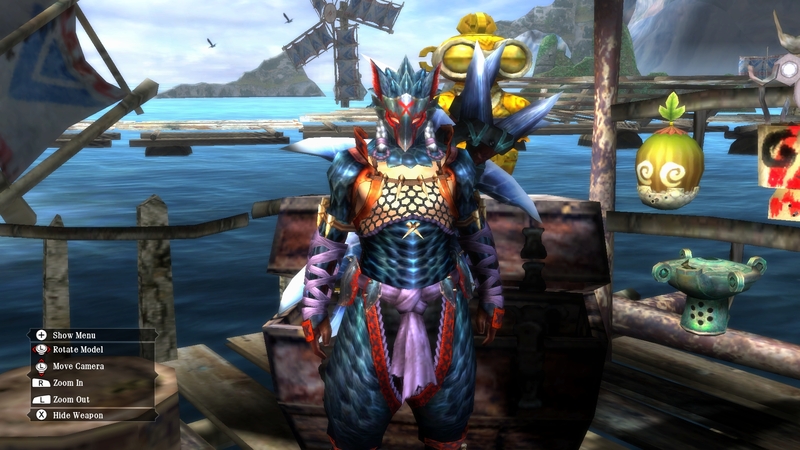 This is how Monster Hunter is meant to be played online. Period. It’s worth mentioning that the 3DS compatibility with the game was unstable at launch, which disappointed players who bought both versions of the game, but that has since been fixed, and I’m told is working as it should at this time. Since the launch of the game late last month, Capcom has offered a considerable collection of free DLC quests and various other bells and whistles that can be downloaded right through the game via its own charming client. This is a rarity with current games, and Capcom should definitely receive some praise for the offering. All in all. Monster Hunter 3 Ultimate is still Monster Hunter, and while most fans would be okay with this all the same, the â€œUltimateâ€ subtitle added to this version definitely needs to be emphasized. If you’re looking to get into the series for the first time, this is a great place to start, and if you’ve hunted your share of monsters in this creative caveman world already, like myself, you’ll find there is plenty new to see, equip, and kill to make another two hundred plus hours hours worth your while.